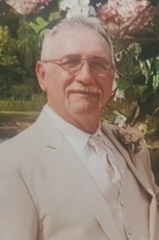 Larry Alan Cochran, 64, passed away on Friday, August 3, 2018, at his home following a valiant fight against cancer while surrounded and held by his wife, children, and loved ones. Larry was a 1971 graduate of Milan High School, and attended Urbana University. A nearly 50 year resident of Milan, Ohio, he loved his adopted home town, and was a fierce and loyal friend and companion to so many. He was an Engineer for Norfolk Southern Railroad for several decades, a job which he was proud of as he had followed in the steps of his grandfather. Much to his chagrin, he didn't pass his love of the game of pool onto his sons, but he was the Erie County Pool League president for 33 years, and had hoped to one day teach his granddaughter the game he loved so. His second passion after pool was the game of golf. Those two games involved some of his fondest memories of camaraderie. "Do adventures ever have an end? I suppose not. Someone else always has to carry the story." Larry's friends and loved ones may call on Wednesday, August, 8, 2018, from 6:00 p.m. to 8:00 p.m. at Groff Funeral Home, 1 South Main Street, Milan, Ohio. A private interment will be held at a later date.